Collecting Olympic pins is a popular hobby, and antique pins such as the famous 1936 Olympic pins are quite valuable. Between 1933 and 1936, more than a million such pins were sold and along with the pins for the aborted 1940 Tokyo Olympics, which were canceled due to World War II, they are some of the most sought-after Olympic pins. It all began in 1896 with the first modern Olympic Game in Athens, Greece as something that those who were on the "inside," the athletes, the games officials and the members of the media covering the events, did with one another. They would trade colorful identification badges with each other. These badges were cardboard disks upon which designs, names and titles were printed. This continued until the 1912 Stockholm games when the first official souvenir Olympic pins were produced. The hobby of pin trading continued quietly through the twentieth century, but in the 1980s it really took off as people outside the pin-trading community discovered the Olympic pins. With all due respect to Clive Barker, the first "pinheads" emerged during the 1980 Winter Olympics at Lake Placid, when thousands of pin collectors and traders descended upon the town in search of these unique pieces of sports memorabilia. By 1988, at the Calgary Games, the Coca-Cola Company had established the first, official, pin trading center. It did a brisk business with about 17,000 people per day coming into the center. Since then, it has become a fixture at the Olympics with world leaders even becoming involved. At the 1994 games at Lillehammer, then First Lady Hillary Clinton and her daughter, Chelsea, stopped in to the center to trade official United States presidential seal pins. Brundage, then President of the International Olympic Committee must have been overwhelmed, indeed. In a move that critics have declared to be appeasement to Hitler's antisemitism, Brundage removed Marty Glickman and Sam Stoller, the only two Jews from the U.S. Men's Track and Field Team. They were replaced by Coach Dean Cromwell with Frank Metcalfe and a reluctant Jessie Owens, who had already won three gold medals. This is what these pins-these little historical relics-represent, the drama and the tension of games played on the brink of world war against a backdrop of vicious racism and antisemitism. They are reminders of what Nash has called "the best organized and imposing Olympics" he has ever seen. 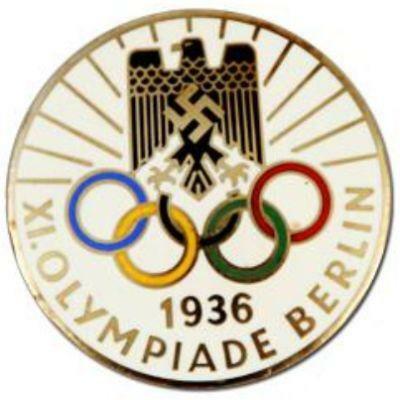 However, they are also reminders of the world's conscious blindness to what the Nazis were doing and of the willingness of the International Olympic Committee-and by turns of the American Olympic Committee-to knuckle under to Adolph Hitler. They are not difficult to find on the Internet. You should check them out, maybe place a bid and take a little piece of history home. When you do, reflect on the lives, the actions and history that stands behind that little pin. Reflect on what happened. Learn the lesson.